You or someone you know has likely been paging through Google Maps’ images just to check a change of scenery, or even because you need to know someone’s address and you suddenly run across a truly odd image. Sometimes, it’s just a guy who appears to be forever frozen in time. Other times, it might be the beginnings of a building that looks especially weird because of the stage of construction it was photographed in. Then there are the times when you run across something truly odd. Going out and looking for these truly strange sights has become a bit of a favorite past time for some people. 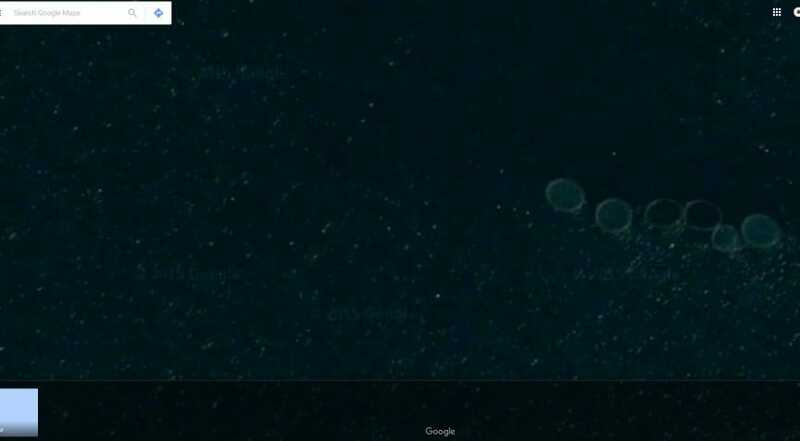 Thanks to those people, you can now check out the 10 craziest things ever seen on Google Maps. Tell us what you think after you’ve looked at them all. 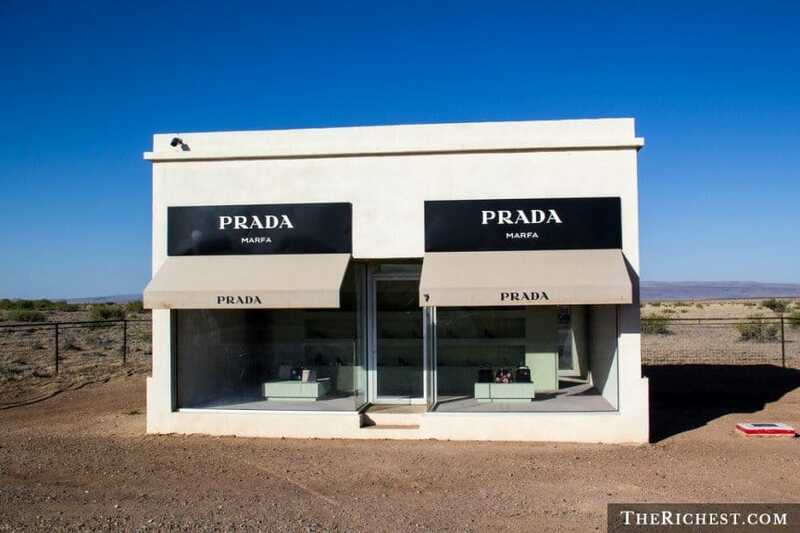 It isn’t unusual to see a Prada store on Google Maps, until you take a look at the store’s location. Located in Valentine, Texas this isn’t actually a store you can go shopping in. The rumors are this was an art project, likely to see how many people driving through the desert would try and buy that special bag. 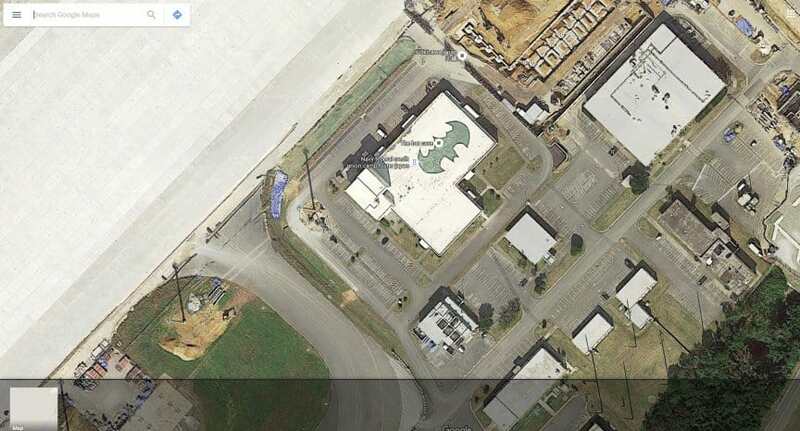 This Helipad that carries the Batman insignia is located in Osaka, Japan. The building is the Federal Credit Union for the United States Navy in Japan. There is no mention of the comic book hero’s insignia on the bank’s website, so its not clear why the symbol is there or who put it there. Located in Stöðvarfjörður, Iceland, it’s hard to figure out just what exactly these circles are. At first glance, they appear to be rather large plastic lids; but it is difficult to define the exact size of these massive tops, especially since they are being viewed from a satellite. It seems as though no one really knows, or at least isn’t spilling the beans online. While the shape of the land surrounding this particular lake or pond is interesting enough, it isn’t what draws your eye to the picture from Southport, Gold Coast, Queensland, Australia. What is interesting is the fact that the Google Maps camera snapped a photo just as … something created what looks like a rather large “splash” smack dab in the middle. This giant triangle on the ground was found near Surprise, Arizona. According to different opinions, this could be an abandoned air field, a map for aliens or just a strange phenomenon. The air field theory is unlikely, since there were at least five other triangles of the same size and shape in surrounding areas, and it is improbable that there would be that many airports discarded. 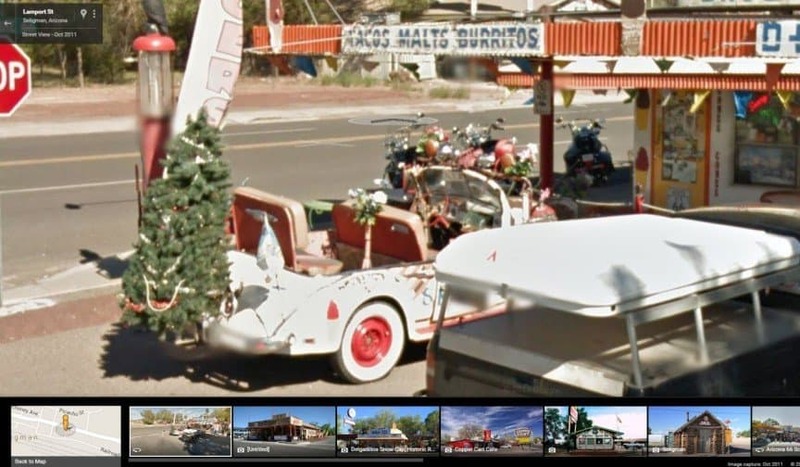 Found in Seligman, Arizona, this car appears to be what Santa drives when he’s visiting the American South West during the summer. The only thing better than finding this car, decked out in Christmas decorations including its own tree is that it was parked next to a taco truck. Apparently Mrs. Claus wanted something spicy for lunch. These Lower Denford, Swindon, United Kingdom crop circles are a little different than most crop circles we know about. 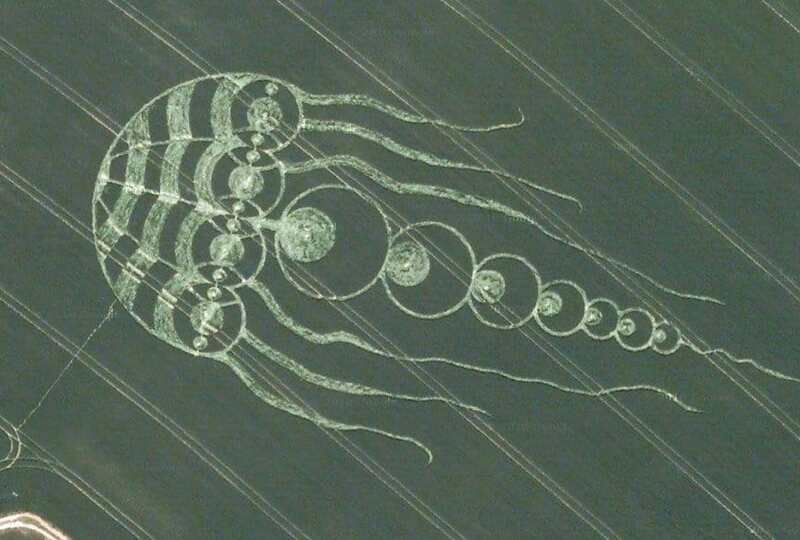 This is the first one in the world that has this particular shape (a jellyfish). This 600 foot long phenomenon has said to have predicted future events when it was first discovered. Solar storms and a lunar eclipse had happened shortly after the encounter of this crop circle, and scientists have reason to believe that someone (or something) was trying to warn us ahead of time. 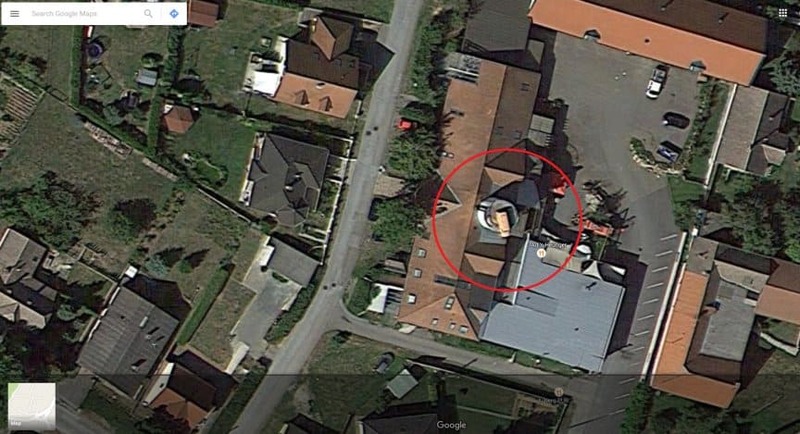 This picture is from Weitersfeld, Austria where what appears to be a large truck is sitting on top of a roof. A little research tells us the building is a bar, but there doesn’t appear to be an explanation as to what the truck is doing up there. The most interesting part is it doesn’t appear to be centered, so it doesn’t seem like it should really be up there. If you visit Seattle, Washington, you will be able to visit a troll that lives underneath the Aurora Bridge. He also happens to be 18 feet-tall and made of concrete. The Fremont Troll was created in 1990 by art students, and has a Volkswagen Beetle in one hand, to let people know that he means business. Every year on Halloween, the city celebrates the troll by having an annual “Troll-o-ween” party. 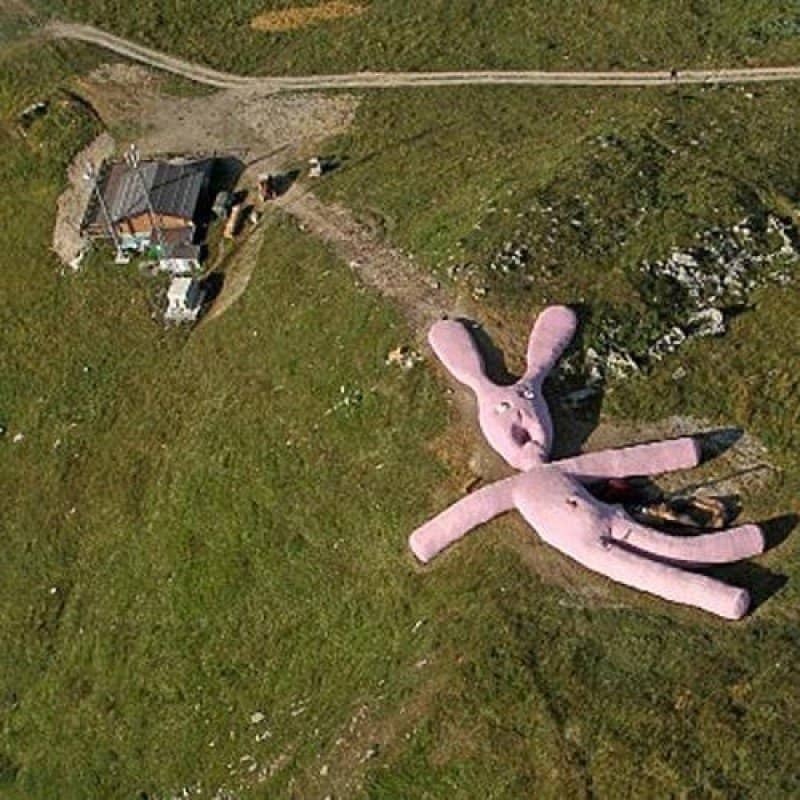 On a mountaintop in Piedmont, Italy, there lays a rather massive, pink rabbit. This stuffed bunny is filled with straw, measures 200 feet long, and is over 20 feet high. This sculpture was made for people to enjoy, by Gelitin; which happens to be the Viennese Art Collective.